Next to me was my teenage son, clapping his own hands and tapping his foot. Both of us were out of our comfort zones and trying our best to keep up with our instructor. I was totally surprised when my athletic, but not-very-musical and certainly not-very-coordinated, high schooler agreed to join me in the class. I’m not sure if I was more excited about accomplishing an item from my bucket list or the awesome bonding experience I was having with my teen. Either way, I was relishing the moment. I first fell in love with flamenco a few years ago, after visiting Corral de la Morería, a famous tablao in Madrid. The whole experience was magical and I was blown away. You can read about it here. I vowed to take a flamenco class at some point. Not to become a dancer (ha, as if), but just for the experience and to help me better understand and appreciate the art of flamenco. It was one of the reasons I wanted to make a stop in Sevilla during our recent family trip. I mean, if you are going to take a flamenco class in Spain, what better place to do it but in the town that is practically synonymous with flamenco? 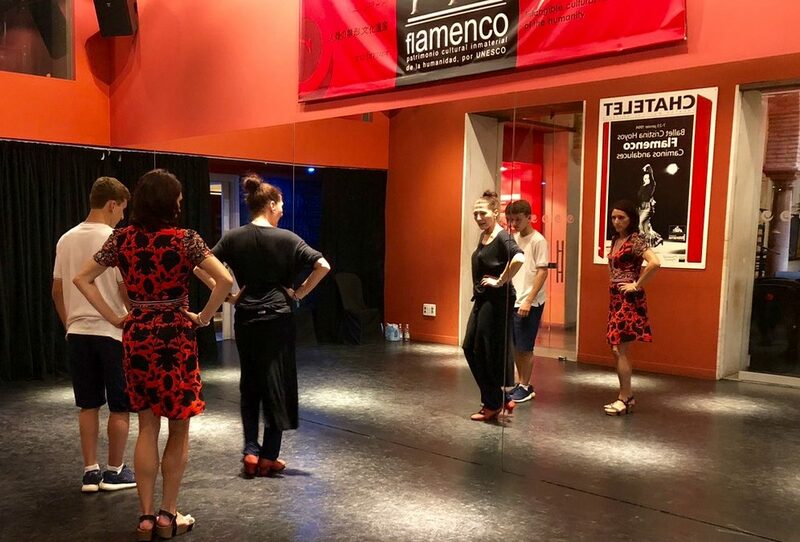 Then, while doing my pre-travel research, I learned about Museo del Baile Flamenco, which among other things (read on), offers classes in traditional flamenco. The museum was established by one of Spain’s most famous flamenco dancers and a native of Sevilla, Christina Hoyos. I knew instantly that I had found my place! I did not know about Christina Hoyos before my visit to Sevilla, but googling her name quickly helped me understand her greatness and why she is referred to Andalucían Priestess of Flamenco. Christina started dancing as a child and did her “training” at the tablaos of Sevilla. She evolved into an international star after she was discovered by Antonio Gades, one of the greatest flamenco performers of the 20th century. After joining his dance company, Christina danced on stages throughout the world. Christina Hoyos has a long, highly impressive list of other accomplishments, which include forming her own dance company and establishing the flamenco museum in Sevilla. She dedicated the museum to those who love flamenco and want to learn more about this genuine form of Spanish art which originated in Andalusia. It is located in the very center of Alfalfa, the same streets of Sevilla where she grew up as a child. The museum is small, but it is a great window into the art of flamenco. It summarizes flamenco’s history, evolution and different styles through photos, paintings, film and several artifacts. One of my favorite parts was the collection of dresses, shawls, shoes and castanets. 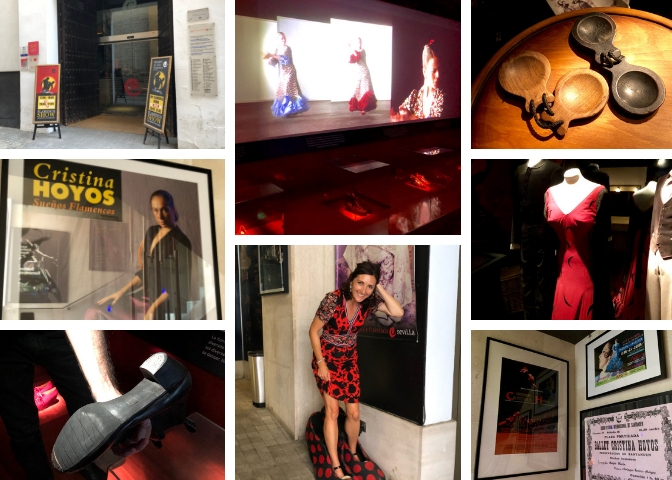 If you have a chance to visit the capital of Andalusia, you should make a stop at Museo del Baile Flamenco, even if your bucket list doesn’t include taking a flamenco class in Spain. You can see Christina’s white dress from the movie Bodas de Sangre (Blood Wedding), which was based on Lorca’s famous tragedy and the gorgeous fiery red dress she wore with purple shoes during her performance at the Barcelona Olympic Games. No history or story of flamenco is complete without experiencing its passion and magic up close and personal. Time your visit to the museum for the late afternoon and you can catch nightly flamenco performances which take place in the charming courtyard in the middle of the building which houses the Museo del Baile Flamenco. The space is small and very intimate, making the performances even more powerful. Sitting in the first row, we were practically touching the artists and felt every foot tap and the movement of the air from the ruffled dresses as they were being whipped around with passion. Just like the performance I saw in Madrid, it was incredible! Flamenco artists at the Museo del Baile Flamenco in Sevilla, enjoying a passionate round of applause after their electric performance. I already told you I found the museo while searching for flamenco classes. 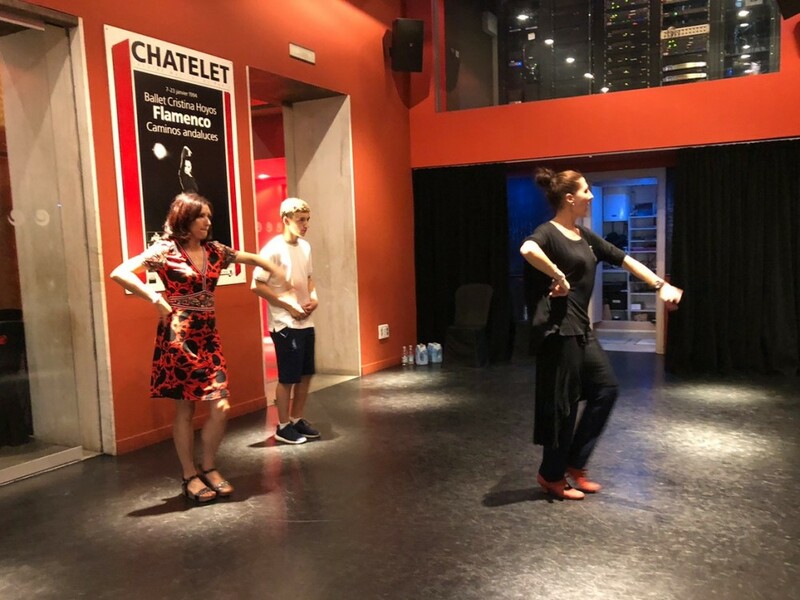 For those who want more than a visit to the museum or experiencing a flamenco performance, Museo del Baile Flamenco also offers lessons and special workshops. The word flamenco as it is used today, refers to three forms: cante, the song; baile, the dance; and guitarra, the guitar music. You can take a class to learn how to dance, sing or play the guitar in the traditional flamenco style. 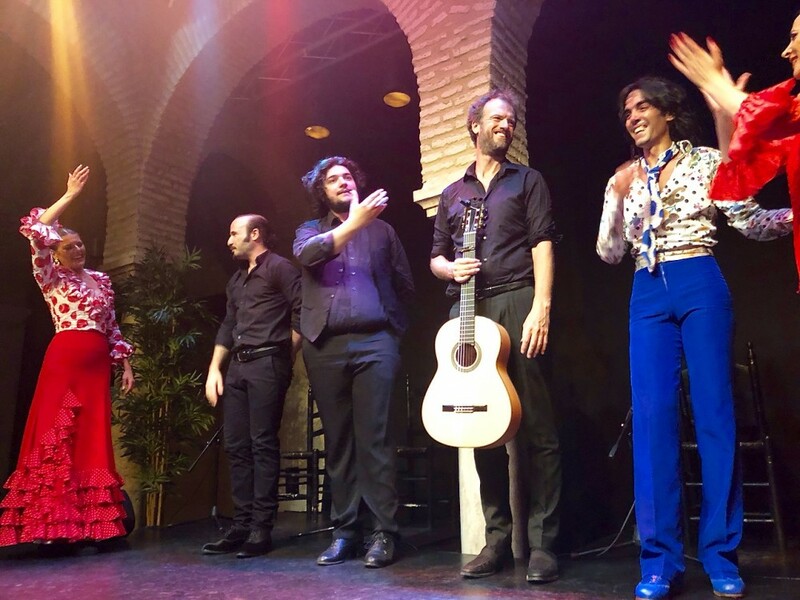 It’s a great way to bring your understanding of flamenco to a whole new level and have a one-of-a-kind memorable experience. … which brings me back to my flamenco class. It was, of course, much, much harder than it looks: following the beat, even the basic steps and jumps, the hand, arm and body movements. Everything that those dancers make look so effortless and graceful. I actually fully anticipated this and it was one reason I wanted to have this experience… to help me appreciate flamenco even more. Which I did. 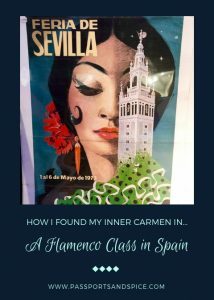 Crossing “take a flamenco class in Spain” off my bucket list was a fantastic, one-of-a-kind experience! What a great and well told story. I can’t dance but this makes me want to try! So glad you enjoyed it. Thank you for your nice comment.